Pope Benedict XVI has created 23 new cardinals at a solemn ceremony in St Peter's Basilica at the Vatican. The pontiff gave each cardinal a red hat, a symbolic reminder that they must be willing to shed their blood for the Christian faith. They now join more than 100 other cardinals who form a college which will one day choose the Pope's successor. But five of the appointees are not be eligible to enter the elite conclave because they are over 80 years of age. The 23 churchmen were elevated to the top ranks of the Roman Catholic Church hierarchy at the special ceremony - known as a consistory - dating back centuries. Patriarch Emmanuel is not eligible to enter the electoral college. 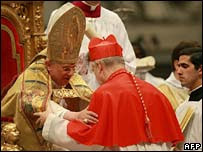 One by one, the red-robed cardinals knelt in front of the Pope, who was seated on a throne, to receive his red hat. The new cardinal electors come from Italy, Argentina, the US, Germany, Poland, Spain, Ireland, Iraq, France, Senegal, India, Mexico, Brazil and Kenya. The loudest and most prolonged applause from the congregation was reserved for the 80-year-old Patriarch Emmanuel, the head of the Roman Catholic Church in Iraq, the BBC's David Willey in Rome says. The Pope said he had chosen to elevate the elderly prelate as an expression of "my spiritual closeness and my affection" for the Christians in Iraq. "Our brothers and sisters in faith are experiencing in the flesh the dramatic consequences of an ongoing conflict and are living in an extremely fragile and delicate political situation," the pontiff said. Patriarch Emmanuel has been extremely cautious since his arrival in Rome not to say anything which might inflame religious tensions in Iraq, our correspondent says. It is the second time since his election in April 2005 that the Pope has created new cardinals. The first was in March last year when he installed 15. At a meeting behind closed doors on Friday, the cardinals agreed that they had found encouraging signs in the development of relations between the Catholic Church and the Islamic world.